If you have tender plants on your porch or patio that need to spend the winter indoors, some of them are probably in big pots. At my house, I bring in about a dozen large pots containing agapanthus, bamboo, phormium, colocasia and a fig tree. Several years ago I discovered an ingenious little device that makes this potentially back-aching job lots easier. 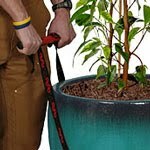 The Pot Lifter cinches around a pot of almost any size, and allows two people to lift and carry it around without bending. Hard to explain in words, easier to see in a photo. Blog post: Where My Tender Plants Spend the Winter. This is a great idea — I have a couple of big’uns out there that may need to come in if our winter is like it was last year. 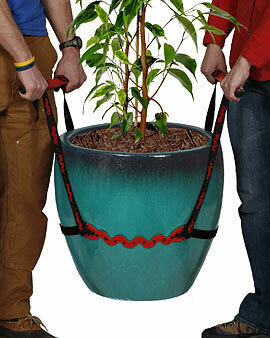 I can attest for this being a proven and safe method for moving large plants and trees. I have several apple trees that are in very large pots that I keep under lights indoors. This method saves my back and is more efficient too. Thanks for sharing.